Hot Bagels Abroad, North Jersey's home of the best Bagels and Deli. Let Pat and family serve you breakfast, lunch or cater your next event. All independently owned and operated, Hot Bagels Abroad has locations in Flanders, Bloomfield and Hackettstown. 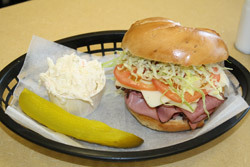 Check our daily specials as well as our everyday menu for a new alternative to what ever you may crave. Join our customer list and be in the running for a FREE Lunch! Join us on Facebook to be the first to hear about specials and updates!